Businessman Steve Hagerty addresses supporters after claiming victory in the Evanston mayoral race. As of early Wednesday morning, Hagerty received about 160 more votes than Ald. Mark Tendam (6th), who did not concede defeat. 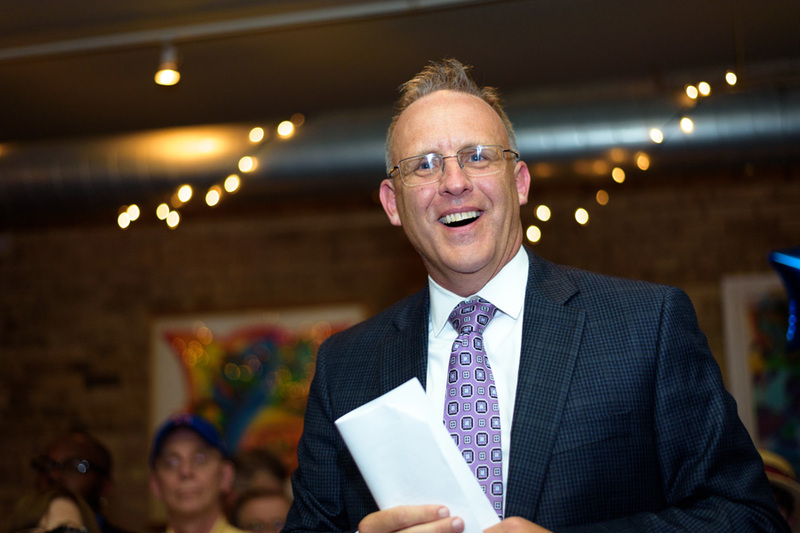 As of early Wednesday morning, businessman Steve Hagerty had won the most votes in Evanston’s mayoral race, capping off a roughly six-month long season that included a rare primary and a slew of contentious legal challenges. Hagerty, a first-time politician who pledged to build on “generations” of work, gained about 50.5 percent of the vote and was narrowly trailed by Ald. Mark Tendam (6th), who received roughly 49.5 percent. Hagerty bested Tendam by just 159 votes. Tendam said he would not concede Tuesday night, choosing to play a “guessing game” and wait until all remaining mail ballots are counted. In Evanston, at least 17,827 residents voted in the election, about 7,450 more than in 2009, the last contested mayoral election. Cook County clerk communications director Nick Shields told The Daily in an email that 1,977 mail ballots were requested by Evanston residents. As of about 7:30 a.m. on Tuesday, a little more than 1,000 of those had been returned to the clerk’s office, Shields said. So long as outstanding ballots were postmarked by April 4, Shields said they would be counted in the final tally, which will occur within roughly three weeks. Evanston Clerk Rodney Greene could not be reached for comment. Hagerty received support from mayor Elizabeth Tisdahl, two former mayors — Jay Lytle and Lorraine Morton — and Cook County commissioner Larry Suffredin. What should have been the end of an especially tense election cycle — marred by numerous legal objections and confusing paperwork — has ended in uncertainty. It was the second test for the two candidates. In February, Evanston held its first primary election in recent memory, which narrowed the mayoral race down from five candidates to two. In that primary, Hagerty won roughly 44 percent of the vote, with Tendam earning about 20 percent. This year’s election is also on track to become one of the most expensive in Evanston history. Between mid-August and the end of 2016, Hagerty raised $109,079 and spent $80,374, while Tendam raised $16,245 and spent $2,323. Tendam said he was disappointed by the results and attributed the slim margin in part to less funding. Supporters of Hagerty gathered at Prairie Moon, 1502 Sherman Ave., to watch results come in and celebrate their victory. Sean van Dril, a McCormick senior who helped out on the campaign, said Hagerty was committed to listening to students. Van Dril pointed to the candidate’s promise to meet with students quarterly as evidence. This story was updated at 2:30 a.m. with additional information.